LED vs. CFL: Which is Better For Your Apartment? Light bulbs are a common part of every household, but you probably don't give them much thought until it's time to replace them. The continuing move to a "green" lifestyle is eliminating traditional incandescent bulbs in favor of more energy-efficient styles. You will now need to select between light-emitting diode (LED) or compact fluorescent (CFL) options. Which one is a better choice for your Springs Apartments home? Here is a side-by-side comparison of the features of each one to help you make an informed decision. CFL bulbs have a slightly different base but are otherwise similar to the classic bulb shape you are accustomed to. On the other hand, the sleek spiral tubes of LED bulbs make them look like something straight out of The Jetsons. 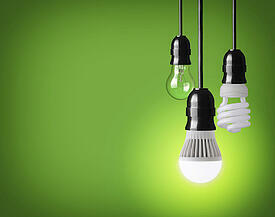 LED bulbs are the more expensive of the two, but they last longer than CFL bulbs. Over time they can be the more economical choice because they won't have to be replaced as often. In addition, continuing improvements in the manufacturing process are gradually bringing costs down. CFL bulbs are fluorescent so they provide the diffused light often seen in schools, offices and other public buildings but without the harshness associated with those tube-like bulbs. Light from LED bulbs is directional, focused in one particular area. Both types are safe for household use. However, CFL bulbs contain mercury, a heavy metal that is dangerous to humans. A broken CFL bulb requires immediate and thorough cleanup. Even undamaged CFL bulbs cannot be placed in your household trash. A local waste management company can instruct you on the proper procedure for disposal. Based on this information, it may be a good idea to experiment with both types of bulbs to see which one you prefer. Try CFL bulbs in your living room, bedroom or any place where you want more overall lighting and use LED bulbs where clarity is important, such as in a reading lamp. You might find that a mix of both is best for your needs. Our team at Springs Apartments encourages and supports an eco-friendly lifestyle. We're always open to suggestions on creative and useful ways to save energy and resources. Please share your favorite tips in the comments!